Sargas (θ) is the bright star at lower left. Sargas (Theta Scorpii) is the third brightest star in the constellation Scorpius; its Sumerian name is of unknown meaning. 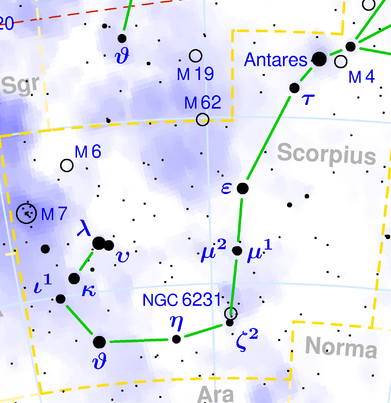 Sargas is the most southerly bright star in the Scorpion, closely anchoring the southern curve of the scorpion's tail, and is invisible north of latitude 50° N. The star's southerly position has allowed northern observers to use its visibility as a test of the night-sky brightness near the horizon. Scorpius is filled with bright blue-white stars of class B. As a yellow-white giant F star, Sargas is again an exception. Though its equatorial rotation speed is high (over 50 times that of the Sun), the large size still gives it a fairly long rotation period of 10 days (or less). There is no question that the star is rapidly evolving with a dead helium core toward lower temperatures. One hundred million years ago, it was a B star like many of its constellation neighbors. As the star swells and the surface cools, it should in under a million years become a Cepheid variable, and then become a red giant five times brighter than it is now, at which point the helium in its core will begin to fuse to carbon and oxygen, setting the stage for it to become a massive white dwarf.